To visit Boundary Brook Nature Park, become an OUWG Member or contact us by email, post, or use the contact form below. Boundary Brook Nature Park lies at the end of Boundary Brook Road, just off Iffley Road opposite the junction with Donnington Bridge Road. 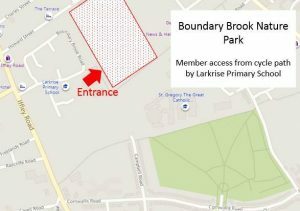 The entrance is beside Larkrise School (OX4 4AN) at the start of the cycle track. There is free parking in the road and Stagecoach Route 3 passes the end of Boundary Brook Road.